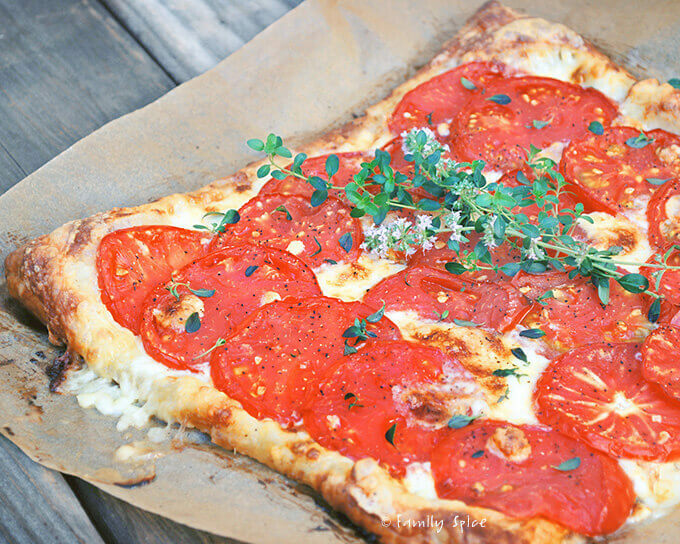 By using a sheet of puff pastry, you can quickly assemble this delicious Tomato Brie Tart for those last minute party guests. What does it mean to be a blogger? Does it make a difference if you are a “professional” blogger? Does that word really make a difference? Most of us women in the blogosphere are labeled “Mommy Bloggers.” As if this label is something bad, sloppy or dare I say, UN-professional? I suppose the level of each blogger’s professionalism is probably based on the reason why they started blogging or what the purpose of the blog is. Why all this professional talk? I sat in on a seminar at the BlogHer convention over the weekend:Putting the “Professional” in Professional Blogging. The topic is super relevant for any blogger who wants to make a living out of this, no matter what they write about. Being professional isn’t a foreign concept that has never been discussed before. But, from what the panel described, there must be many bloggers who have forgotten what “professional” means. Most of us started with zero readers when we started blogging. Maybe friends and family tuned in, every now and then, but for the most part, it was just you and your words. A shout in the dark. But, over time, your words get read. You develop a following. And whether it’s ten people or a thousand, your words are being read. An image of the writer behind the blog is being formed. And each blogger has the power to develop whatever image they desire. I used to work in advertising, the business of deception according to some. There I found myself immersed in what I loved, graphic design, even though I began on the business side. I have tried to keep this blog as professional as possible, although I admit that I might have slipped now and again, when I felt frustrated or upset. But this seminar reminded me that you never know who may be reading your blog, your tweets or your Facebook fan page. 1. Be honest, in your posts and in your business relationships. Insincerity is easily recognized, so keep your posts authentic. If you are working with a brand, don’t make promises you can’t keep. If an emergency pops up right before a deadline that you can’t meet, speak up. But remember, life happens to everyone. We all have families, children, obligations. Don’t let your toddler’s afternoon nap keep from following through on your promises. 2. Don’t copy and paste a press release. If you are sent a product to review, don’t just rework the corporate copy and make sure you include your opinion. Original content is key. You were hired to represent this brand through your voice. 3. Keep your online integrity. If you want to project a family-friendly identity, don’t drop the F-bomb on twitter. Don’t get blitzed at corporate parties or conferences. Yes, brands read your tweets, watch your behavior and google your name. You can be true to yourself without selling yourself out. But, if you want brands and corporate sponsorships, don’t let your dark side crossover into your public life. 4. Use spell check. Have grammar problems? Have a friend edit your post. Clean up your blog. Don’t bombard it with photos and frills that slows down the load time. Keep your blog easy to read. 5. Make sure your contact information is easy to find and not a comment form. ‘Nuf said. 6. When working with brands and PR companies, keep the communication lines open. If you want to work with a brand, pitch it. If you were sent a product and you didn’t like it, be honest and call your contact. If you didn’t get picked for a campaign, send an email and ask why. Thanks to Amy Lupold Bair from ResourcefulMommy.com and Global Influence, Janine Nickel from TwoferMom.com and Buzz Cooperative, Jessica Rosenberg from ItsJessicasLife.com and Tiny Prints, and Linda Sellers from ShortPumpPreppy.com and One2One Network for their candor, insight and humor. Oh, the tomato tart? I thought it was a prettier picture than some boring office picture or BlogHer logo. We are still over-flowing with fresh garden tomatoes, not that I’m complaining! I made this tart pretty quickly when for a small dinner party. 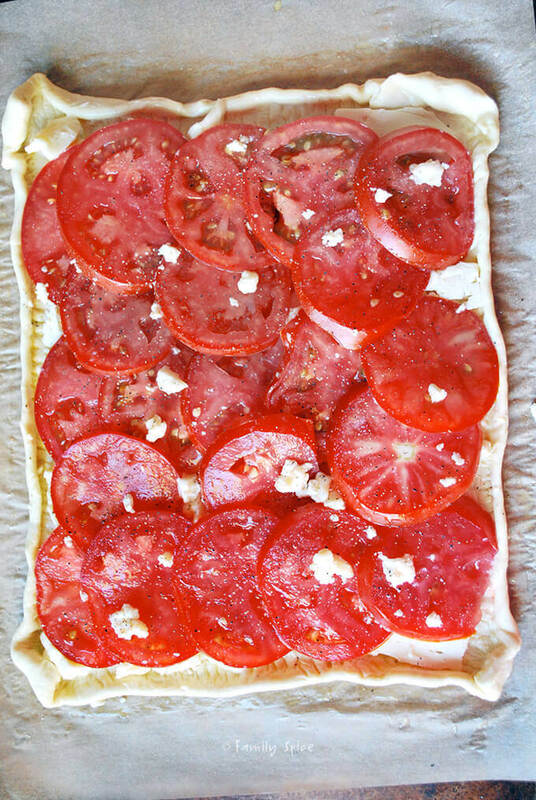 Very simple: puff pastry, brie, tomatoes. A little egg wash for the crust. Salt, pepper and thyme. We were fighting over that last slice. Starting with one side of the sheet, brush edge with water and fold over toward the inside of your tart, forming a 1/2-inch border. 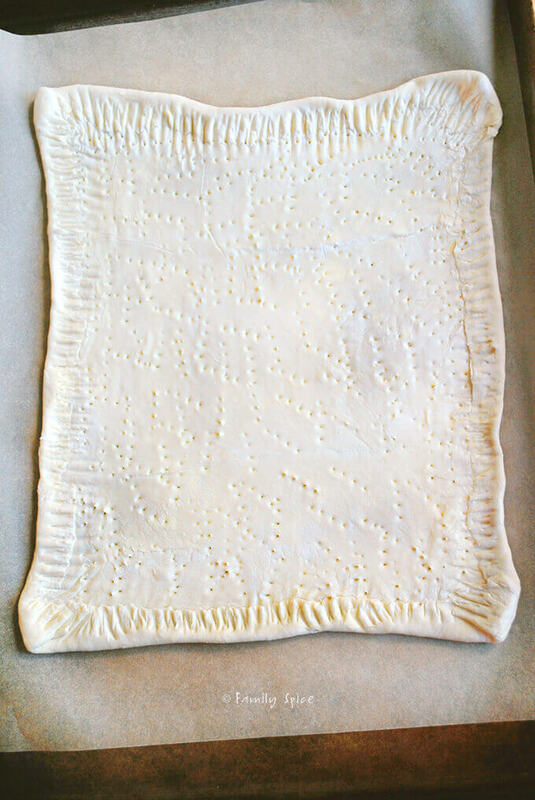 Using a fork, press border edge seam into the tart. Repeat with the other 3 sides. Using a pastry brush, brush this outer border with the egg wash.
With a fork, pierce the inner base of the tart, where the filling will be placed. 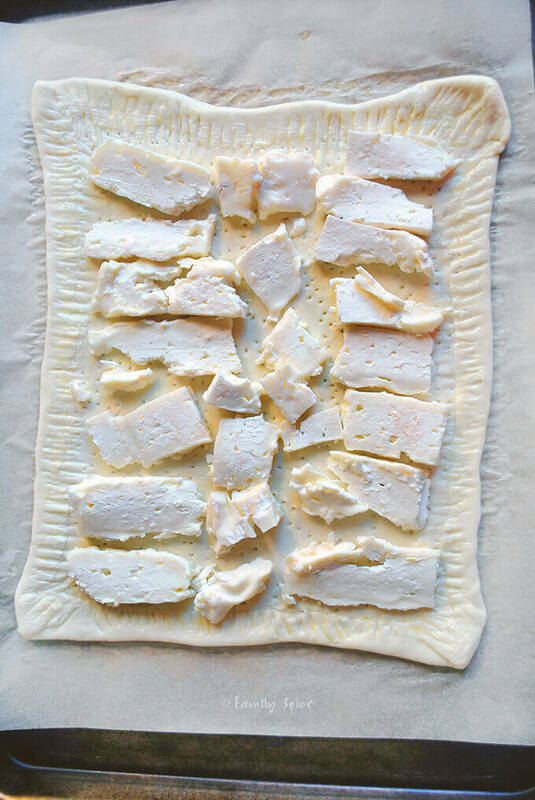 Place tart shell onto the prepared baking sheet and refrigerate for 20 minutes. Bake in the oven until pastry is golden brown, about 20 minutes. Remove from the oven and let tart rest 5 minutes in the pan, then place on a serving platter. Thanks so much for the nice recap of our session. I'm so glad you enjoyed it and got so much out of it. And nothing wrong with a little food eye candy in any post! I think I know what we are having for dinner! Linda, I've been home with the kids for over 10 years. Your talk reminded me of the obvious, but I needed to hear it. I know I'm not the only one in in your session that felt this way. Thanks for stopping by my blog! What a great post! I try to be professional and have a line when I blog. But I am new (only 4 months), so I definitely still have a lot to learn! I enjoyed your recap almost as much as I enjoyed being on the panel! It's always interesting to read what people got out of a session. And if your professionalism is anything like that tart, you are rockin it. What a great post- those are all great tips! It's so important to keep those things in mind! 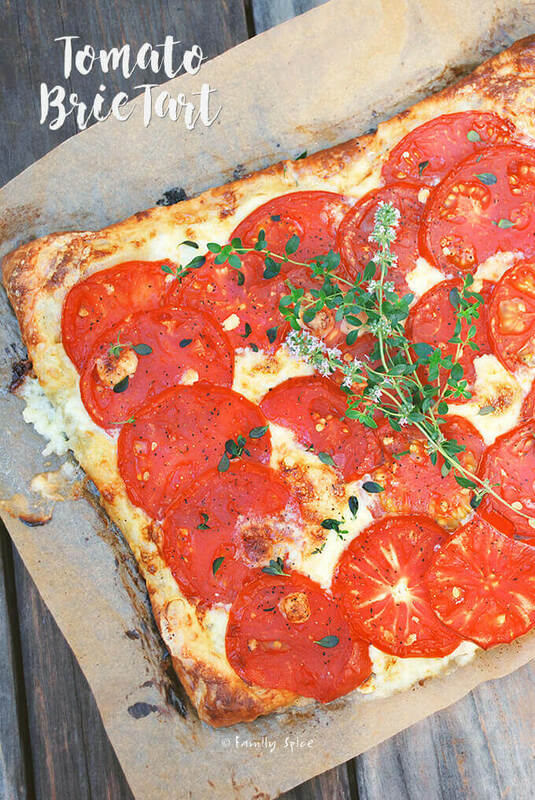 Your tomato and brie tart looks so yummy. You know, all of these tips really are common sense, although they are worth pointing out (because not everyone has common sense!). Twitter is a tough one for people, I think they view it as just chatting with friends. But it's so public, one has to beware of what they are saying! I love this post. Not many foodies talk about what happens behind the scenes (of course unless it is a bunch of us hanging out behind the scenes). Great tips. The tart looks gorgeous too! These a good tips. I don't if my blog is professional or not but to me it is not importantl but I know I am sincere and will not try to portray what I am not. Until now there is no intention to make money from blogging other than to meet with some great fellow bloggers and share the same passion in cooking and baking. All I know is, I enjoys sharing both my joy and my sadness with my readers, fellow bloggers, friends and family through my blog. Your tomato and brie tart looks delicious and I am a big fan of blue cheese! Well, now that I am back to nurturing my own blog, you have give me a different kind of food for thought. Hmmmmmmmm . . . am I professional when it comes to blogging? Good question. I will have to do some self-reflection on this front. thanks for all those tips, very informative! Your tart looks so yummy! i'm gonna have to try it! Exactly what I had in mind for a side with a sirloun an red wine. Tnx for sharing this great idea.